June | 2011 | Frank & Donnis Travel Blog "the more we see the more there is to see"
During our travels we often see stuff that is old, falling apart, or just plain rusty. Or a combination of all three. Ten of those Rusty Stuff items are shown below. We will include more Rusty Stuff posts in the future. Please click on each photo to enlarge it. Then click on the enlarged photo to enlarge again. Bawley Point Jetty. 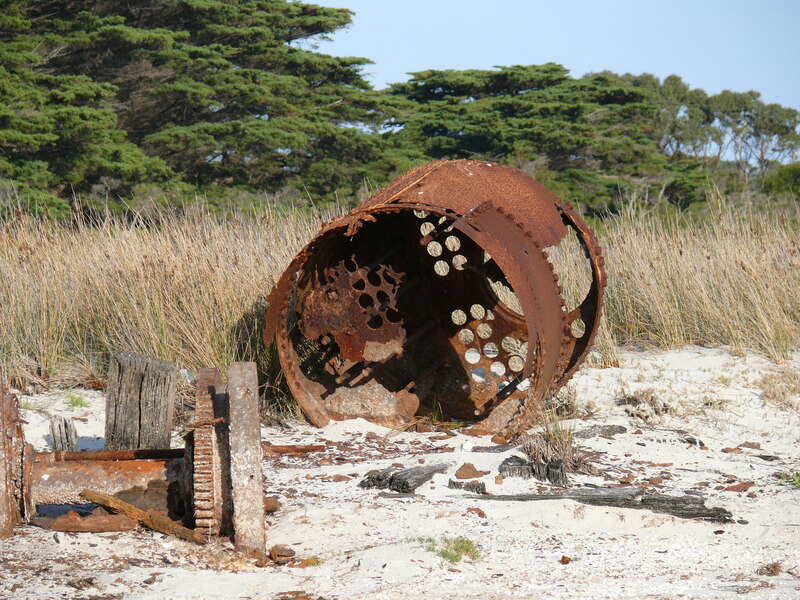 The rusty remains are parts of the machinery used to load timber onto ships sometime in the late 1800 's. The area once housed a large sawmill which was reputedly the largest in the southern hemisphere at the time. The mill employed 72 men. The photo was taken in May 2009 on our way home from Tasmania. 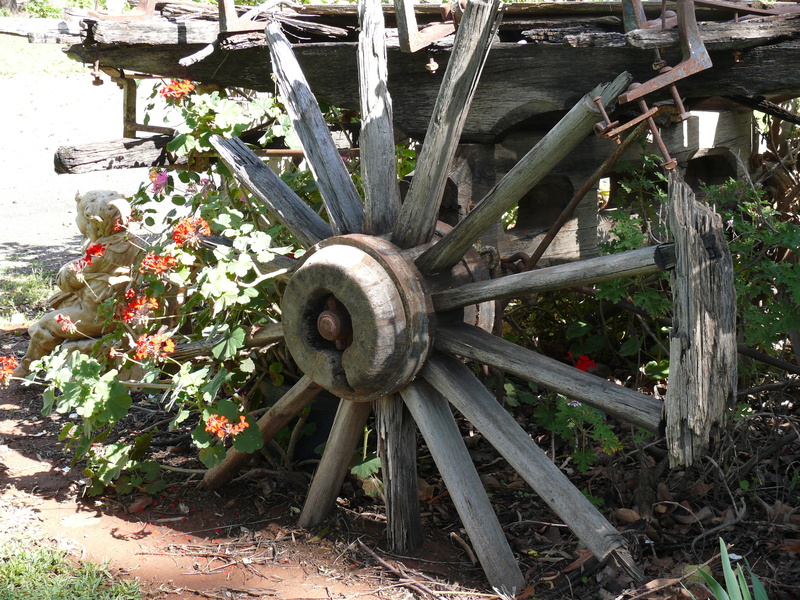 Rotting buggy wheel located at Kidmans Camp Caravan park, Bourke, NSW. Photo taken October 2010. 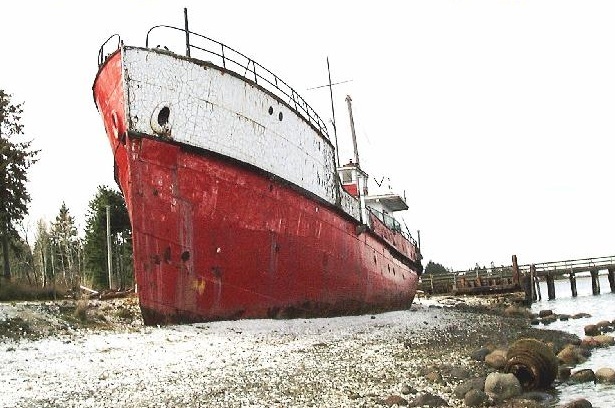 This ship once stranded, was turned into a restaurant which itself went out of business. It sits on the shore somewhere between Bowser and Qualicum Bay Vancouver Island, Canada. The shoreline is layer upon layer of oyster shells either from Indian habitation, or more likely the nearby oyster farms. Photo was taken during our trip to Canada (not chronicled in this blog) about 2002. Ronnies Place at Pinnacle, Qld. Here is some useless information. 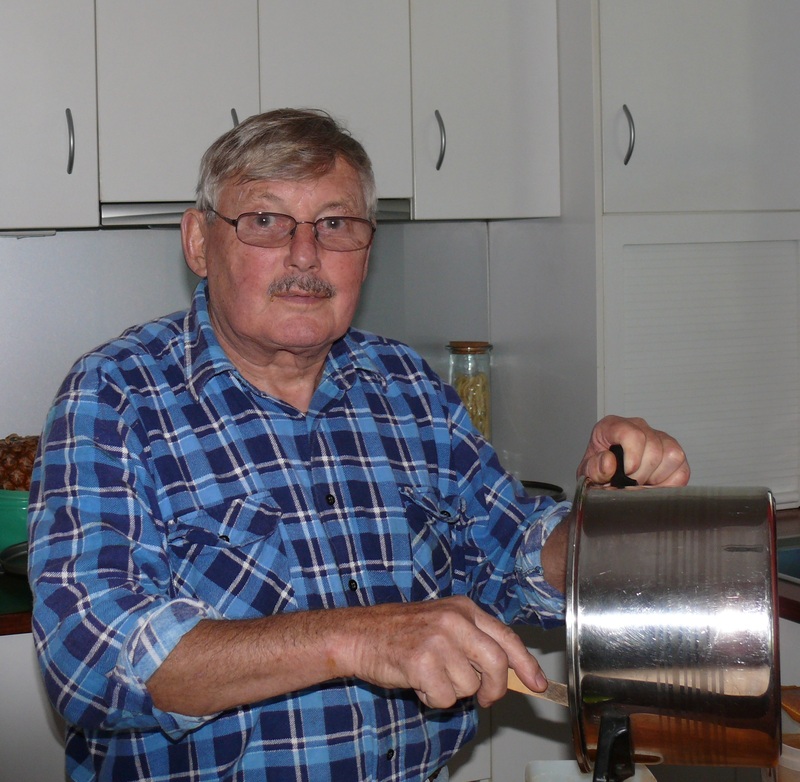 Ronnie was a well known chef in Mackay. She opened her own coffee shop called the pink something. She was well known for savoury pancakes and pastries. She moved to the Rainforest Cafe at Eungella at the top of the mountain range west of Mackay. Her speciality at the cafe were sausage rolls. She moved to the rainforest at Finch Hatton Gorge and started the tradition all over again, called it Ronnies but the business closed due to lack of tourist numbers. From there she started again at Pinnacle and simply called the cafe Ronnies Place and extended her speciality to include home made ice creams and smoothies. Again the business closed due to lack of numbers. Since then the house has continued to fall apart. It will collapse of its own accord eventually. 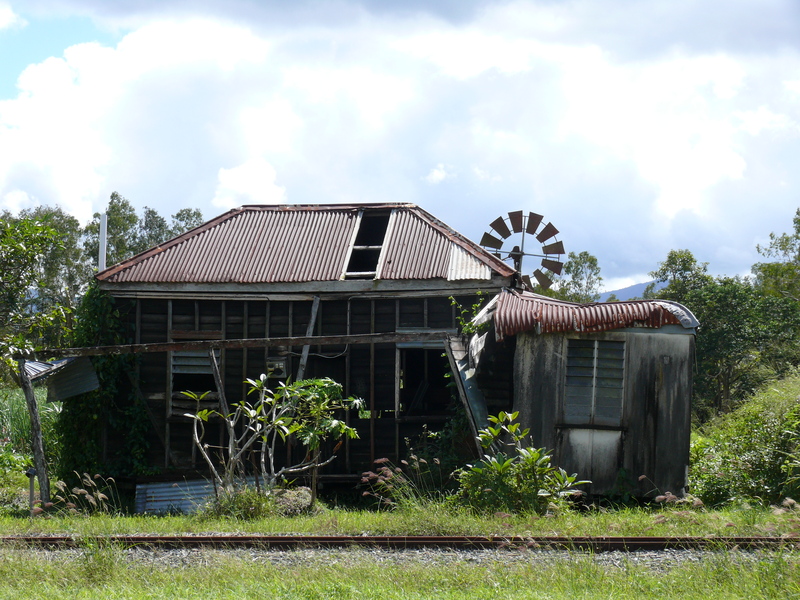 Just a falling down rusting old farmhouse at Finch Hatton, Qld. I have no history about this house. 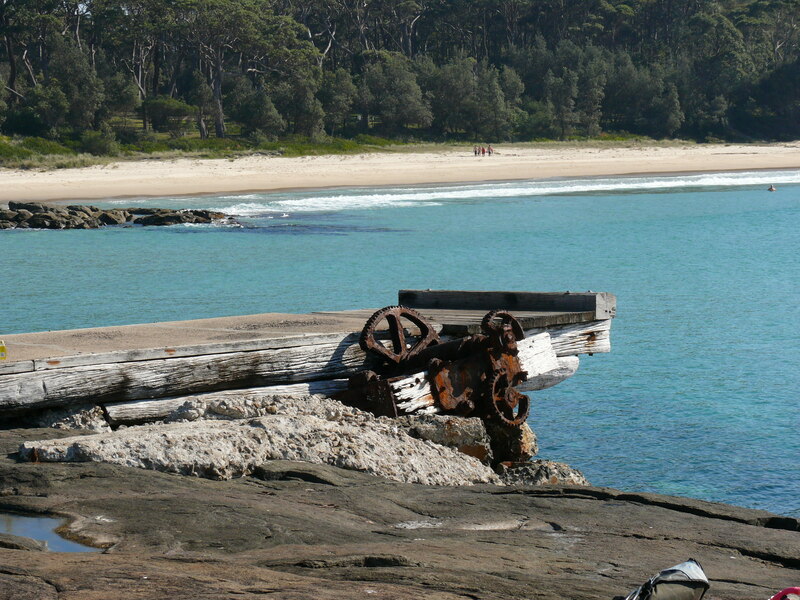 Old machinery on Glasshouse Beach, Victoria. used to unload supplies and load completed glass insulators to be ferried across the lake to a waiting horse drawn cart. Photo taken May 2009 on our way home from Tasmania. 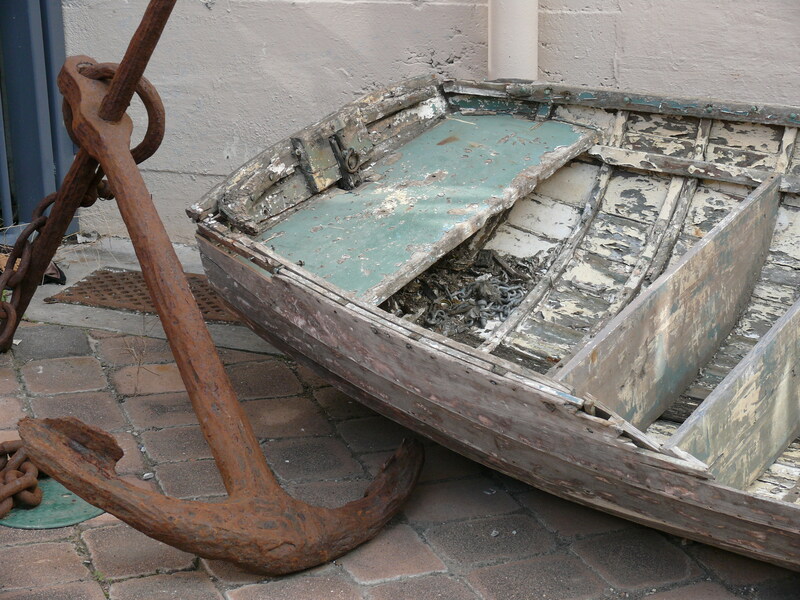 This rotting boat and rusted anchor were found in a delightful old sandstone building with paved courtyard at Constitution Docks, Hobart, Tasmania in April 2009. 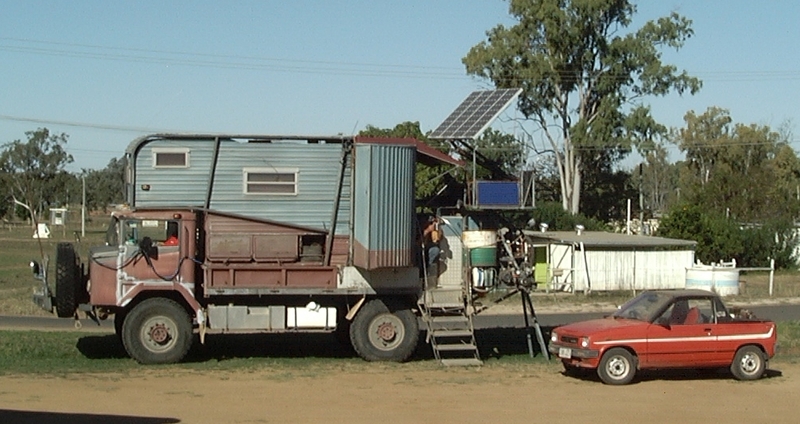 This home built rustic and rusty motor home was spotted at Sapphire Qld sometime around July 2008. If you look carefully (after first clicking on the photo to enlarge it) you can see the corrugated iron toilet and shower beside the owner sitting on the steps. The shower swings back into place when travelling. Note the owner is giving the "finger". Hmmm. Perhaps he did not like having his photo taken. 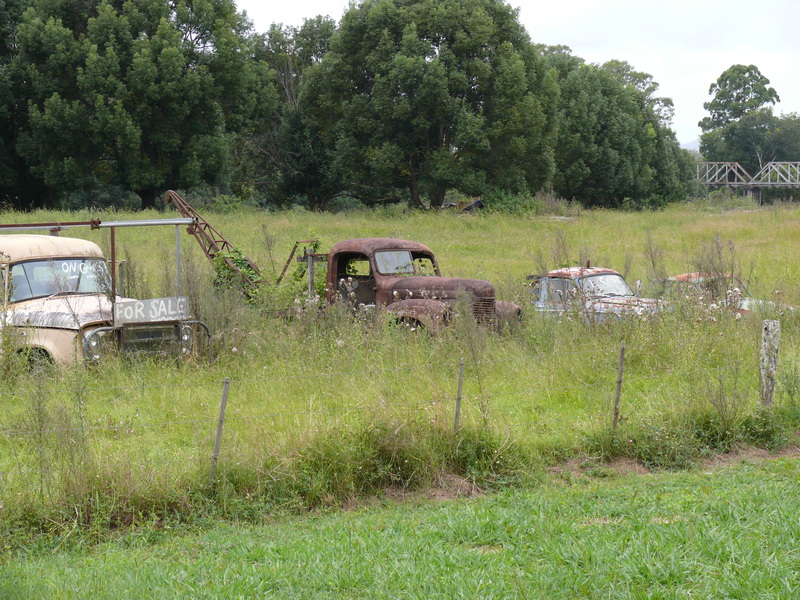 While visiting Imbil, Qld in March this year I was taken by all the rusting cars in the yard of the rusting roofed house and the never painted timber boards. 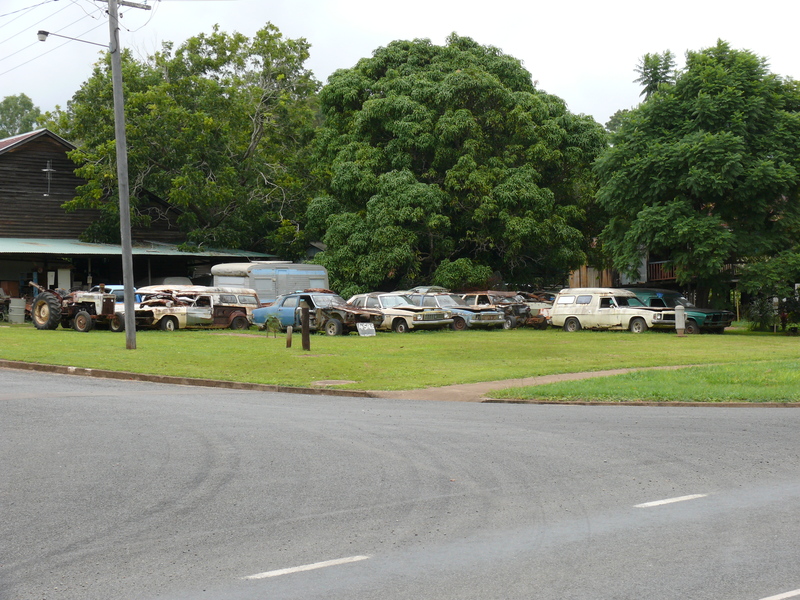 More rusting relics across the street from the rusting house and other rusting cars at Imbil, Qld. While staying in the regional city of Mackay I thought a little bit of history would not go astray. Mackay is and was, a sugar town. At one stage it was totally dependent on the sugar industry. Up until the late 60’s, sugar cane was cut by hand. Now huge harvesters have taken over and the once itinerant cutters are long gone and the skills have gone also. The cutters came from all over Australia to work for the five or six months of the season then return to their home base. A hit musical in Australia and the USA was Summer of the Seventeenth Doll. The play was about the annual trek by a couple of cane cutters to the city in the “off” months. It was also made into a Hollywood movie starring Ernest Borgnine. Can you imagine EB playing the part of a tough Aussie cane cutter? With a yank accent!! 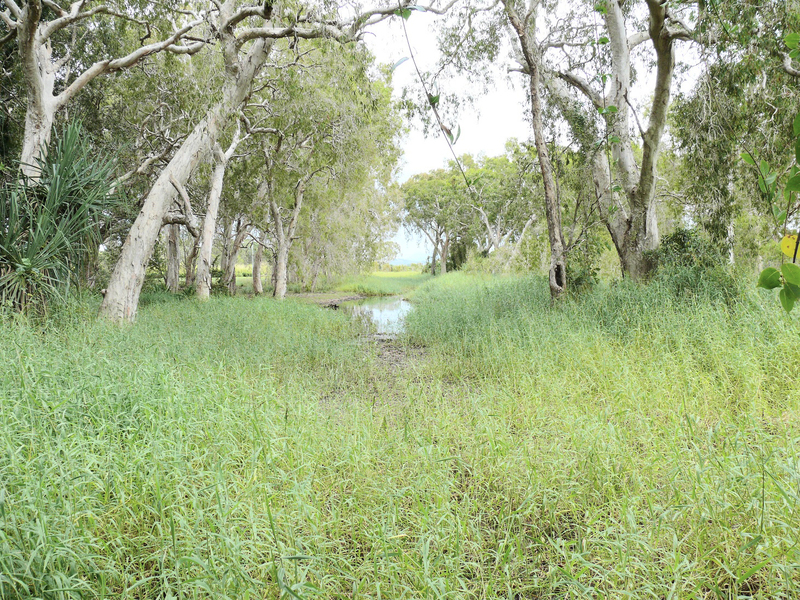 There are four sugar mills remaining in Mackay. In 1988 the mill at North Eton Closed and in 1990 the Cattle Creek Mill at Finch Hatton ceased operations. I recall when the North Eton and Plane Creek mills gave notice of closure to employees, tempers ran hot as did the letters to the editor in the local newspaper, The Daily Mercury. In all, twenty two mills were started in the district, most only staying in business a few years, some even notched up a century of crushing sugar cane. A mill still operates at Plane Creek, Sarina, 40 klms south of Mackay and another at Proserpine 125 klms north of Mackay. Technically they are both still in the district. Little villages sprang up around the mills and over the years, as mills closed, the villages all but disappeared and exist sometimes in name only or an inexact location. Places such as Te Kowai, Foulden, Balmoral and Dumbleton. 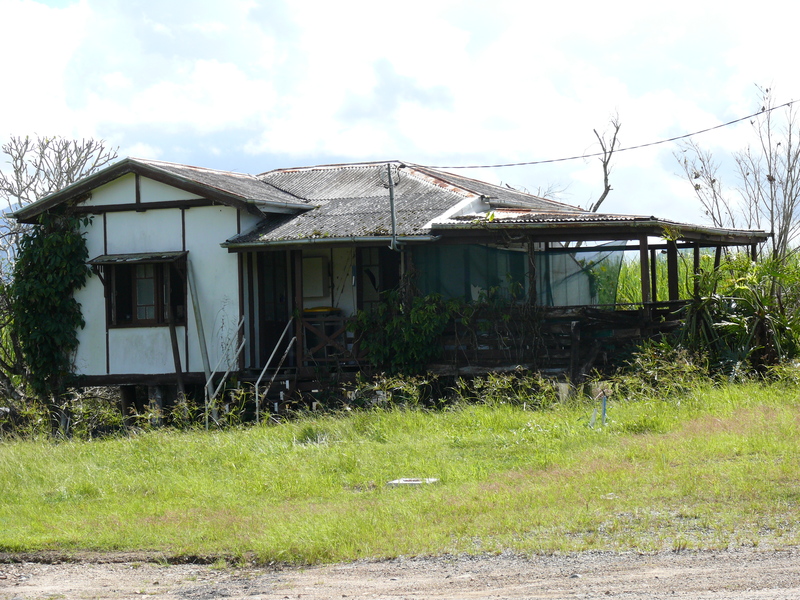 Some villages became large enough to support a town or suburb of Mackay and still exist today. 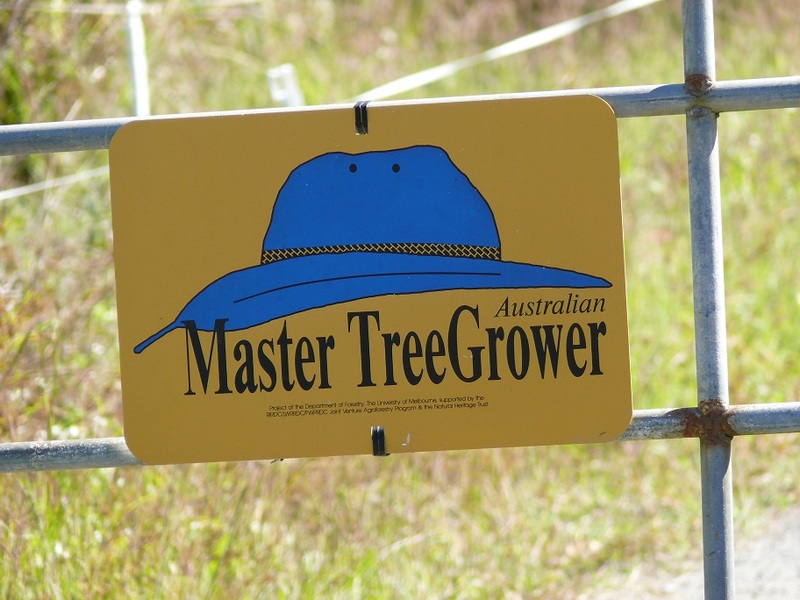 Some examples are Bakers Creek, Finch Hatton, Mount Pleasant and Habana. To give some idea of the size of the cane growing area of Mackay (excluding the area of Sarina to the south and Proserpine to the north) it starts about 20 south of Mackay extends another 80 klms to the north and another 80klms to the west where it ends at the base of the great dividing range. That is a huge area, mostly under cultivation. As you drive the Bruce Highway, in places you can see the sugar cane stretching before and around you, as far as the eye can see. 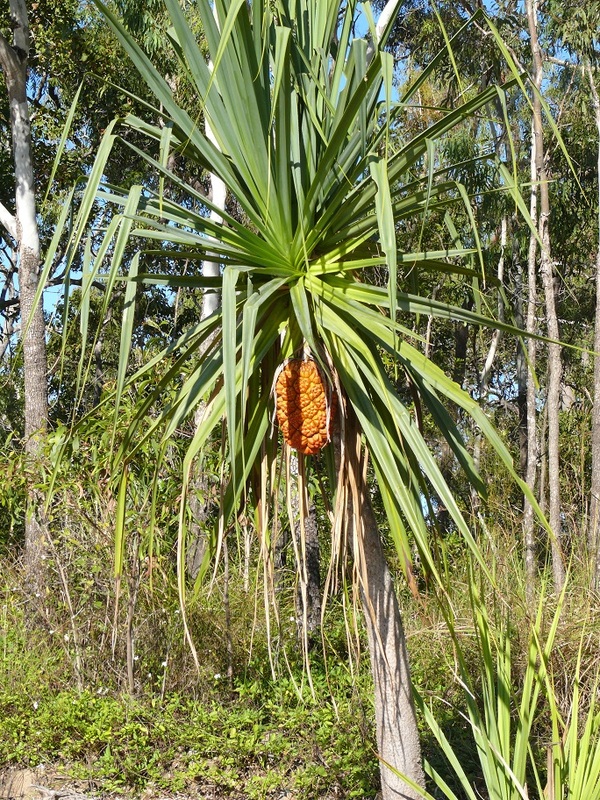 At present the cane is higher than an elephants eye (up to 3 metres), is in flower and ready for harvest. Mackay now exists to supply and support the coal mining industry in the Bowen Basin to the west. Although sugar plays an important role it has slipped to second or even third place. The tourism industry and the cattle industry are contenders as well. Over the 9 months we have been on the road and the many weeks and weekends we have been away in the past, campsites have always been discussed. Generally there were campsites we enjoyed more than others. Those “favourites” on reflection, were favourites because of an emotional response. Or because of the facilities which were available. In order to determine a campsite rating I have borrowed a rating system from Amy and Tom of the OZ360 blog. Thanks Amy & Tom. Their rating system suited them and I have made my own modifications to suit us. The ultimate rating is out of a possible 20 points. Points are awarded for certain criteria and negative points deducted for negative aspects such as costs at a caravan park. The results have been surprising. The current caravan park at Bucasia, which we like, due to the location, scores 15 whereas Byron Bay which neither of us liked very much scored 12. A very expensive caravan park in Brisbane with a 5 star rating according to RACQ and NRMA, which we neither liked or disliked, only scored 7. Clearly the emotional appeal alone cannot be used to determine what makes a good campsite. On the other hand, freedom campsites which do have an emotional appeal can score high irrespective they are lacking in facilities such as toilets, showers and fresh water. 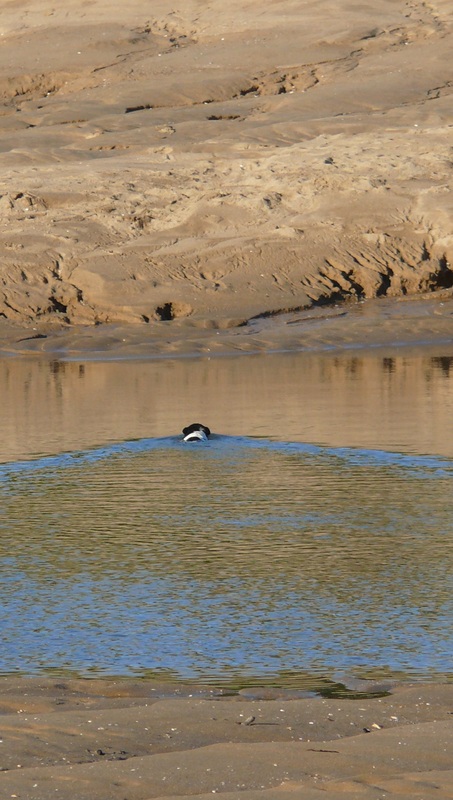 Carmilla Beach and Bingara on the Gwydir river both scored 10 and both are memorable for us. We slept in until almost 7.30 this morning as we both have a day off. 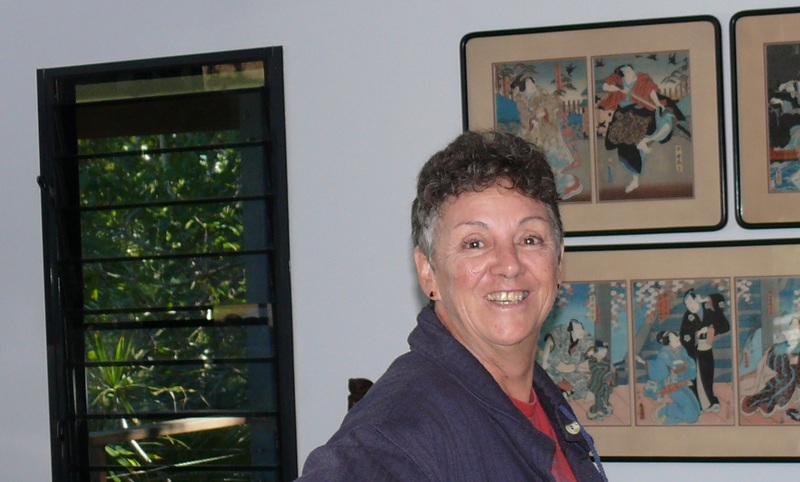 In fact Donnis has resigned from the Good Shepherd Lodge and starts work next Tuesday at the Nanyima Nursing Home at Mirani. 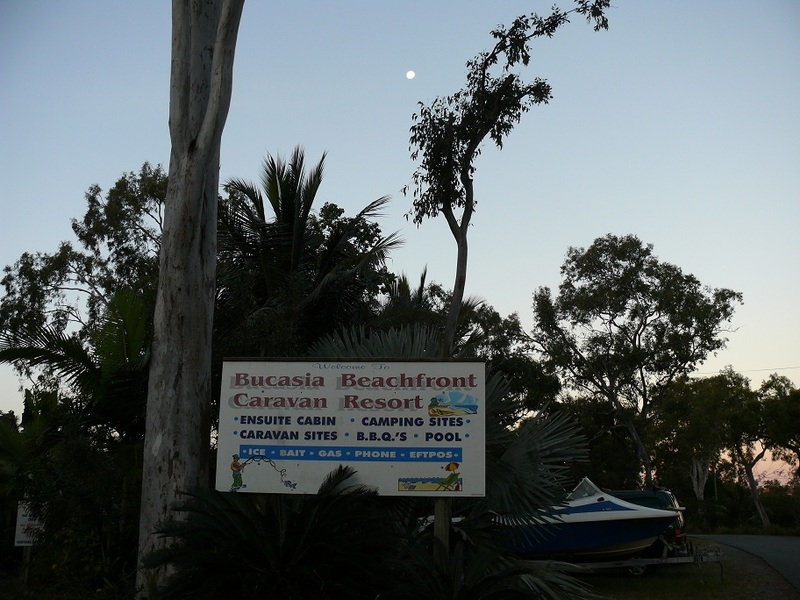 SO… we leave our lovely spot here at Bucasia Beach and head to Finch Hatton next Monday. We will stay with Melissa and Steve, again, as it is only 20 minutes drive to Mirani, no more than the drive to East Mackay Donnis has done for the last 8 weeks. My work contract has finished although there is one final collection day this Sunday. Workers required for that shift will be advised by text on Thursday. We went to Mackay today and looked for a couple of small items for WWWGO. In the process we found a Turbo Oven at BigW for only $39. Donnis has always wanted a turbo oven but the cost and their size stopped us. Somehow we will find a way to cart this new oven with us wherever we go. It can only be used when we are on 240 volts. I am going to experiment with the oven and learn what can be cooked successfully. I will try a rye bread, a cake and a roast (at different times of course)If it works as well as the instruction book claims, we might start making our own rye bread and when away from power will bake in our gas oven. After a shared lunch we went to the movies. (this is a luxury we do not often have while on the road as we have to budget for the luxury item) The movie we saw was the latest Steven Spielberg blockbuster, SUPER 8. I am struggling in my own mind to classify this movie. It is not for the faint hearted. It is not for young children. It is not a horror movie yet it has the suspense associated with horror movies. Primarily it is a sort of ET without the soft cuddly feel good about the central character wanting to “go home’. It is about a visitor from space, wanting to go home but it is in no way a soft and cuddly creature. Without giving a scene by scene story line I will say there is a long scene of a train crash. The crash leaves the audience gasping quietly. There are no funny lines. It is a tense several minutes of chaos and remarkably you felt that you were right there dodging the debris being thrown around. I wondered what it would have been like filmed in 3D. I suppose the audience would be gasping loudly. This morning after breakfast I started on the project of making Cumquat Liqueur. On reflection it may have been cheaper to buy a bottle of Gran Marnier. However I was seeking the stronger but bitter yet smoother taste of the cumquats. After pricking the 1kg of fruit I packed them into a large container and sprinkled 1kg of sugar over the top. Each piece of fruit started to form a crusty skin of sugar over the weeping pricked holes in the skin. The mix was then topped with two bottles of brandy. The container was put into the dark hold under the floor and will be turned every week to allow the sugar and the brandy to be totally dissolved and absorb the fruit juices. That should take about three weeks. Then it is a matter of leaving it in the dark for another six months when it will be fit to decant. The fruit will be cut into halves and dipped in chocolate. We will write more about the result in six or seven months. I rode the Virago to Finch Hatton while Donnis followed with the Terios, loaded with the pushbike and a couple of recliners which we will not need over the next few days. We collected our mail and found a letter from the Australian Bureau of Statistics offering me a Reserve Collector position for the coming Census. I will be paid for two days training and if somebody else cannot work I step in. We had another luxury today by sharing a steak burger and a beer at Pinnacle pub. I recommend a trip through the Pioneer Valley west of Mackay to the Pinnacle Pub for a cold beer and one of their hot pies which are baked on the premises. The weather bureau promised us cold days for the next three days. It was nice and toasty in bed but outside there was a wind blowing from the south west. Straight off the southern New South Wales Alps by the feel of it. The sun did shine and out of the wind was delightful. In the afternoon we went for a walk along the beach then just sat on the sand in the dying moments of sunlight, watching families pack up from their fishing. The wind had died off so it was pleasant sitting there in the final warmth. 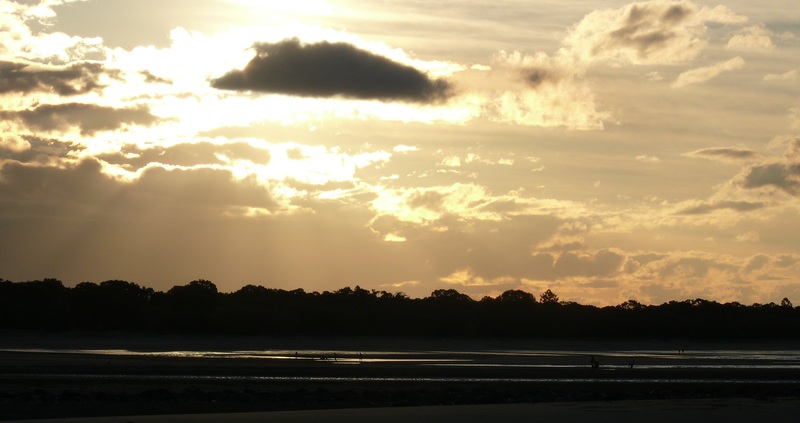 Today was a Show Day in Mackay, a public holiday which is the reason so many people, families were on the beach. For dinner we had Kranski Sausage on rye bread with mustard, sauerkraut and sliced tomato. Thank goodness I do not have to eat sauerkraut again until the next time we both forget I detest the stuff. Give me fried, boiled, steamed, baked or raw cabbage any day. Hmmm. It has been a long time since I have had Kranski. It will be a longer time before I eat sauerkraut again. Donnis made a pineapple upside down cake, from scratch, in the turbo oven. Very nice. This turned out to be a busy day for us. We headed into Mackay to get a letter from my Superannuation Fund so I can complete my Census contract, tax application and pay authority. 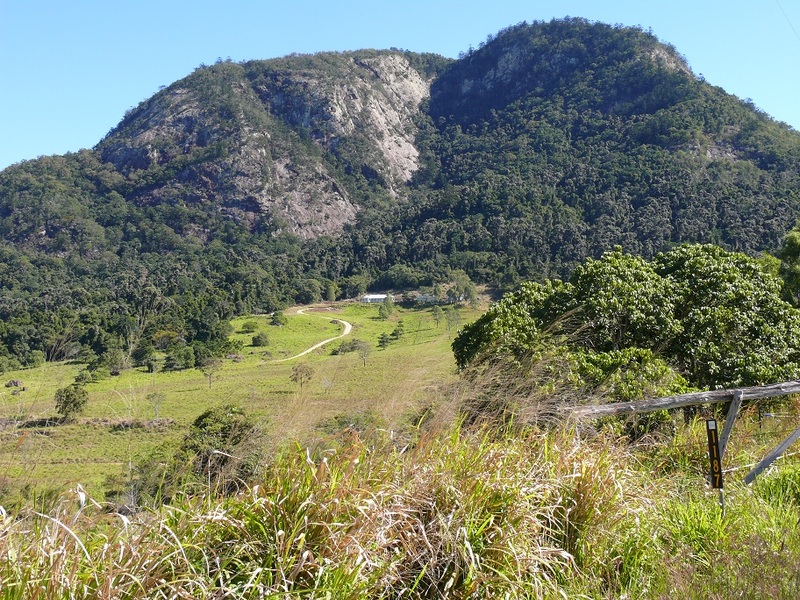 When I delivered the completed papers to the area supervisor she advised me I am now on the starting team and my area will be at the top of the mountain range in the Eungella district including the township, outlying farms, and remote properties as far as Dalrymple Heights and Eungella Dam. Wow! Much of the area will require 4WD so I will get to put the Terios through its paces. We then went grocery shopping and I received a call from the Traffic Survey office to advise the workers have a thank you barbecue on Sunday afternoon at 4pm. An hour later I received a call from the Traffic Survey Supervisor to ask me to work the final shift on Sunday morning. It is going to be a busy weekend for me. We cooked pork belly ribs in the turbo oven. Quite nice really. All the fat drips into the bowl and the rind turned into almost perfect crackling. Not bad for a first attempt. Today we packed WWWGO, put in the awning and are almost ready to move out on Monday. We packed a day early as I have work on Sunday and some of the packing requires two people. We dropped in to see niece Kelly and Jason for an hour and called on sister Sandra and hubby John at their new house. They are in the middle of moving in today and both looked exhausted, especially John. He was not there when we arrived. It seems his mother was in a car accident and he had rushed off to assist. It turns out there are no injuries apart from wounded pride and as John owns the car, his insurance no claim bonus will be effected. Tonight we packed up the turbo oven and drove to visit my daughter Averyl, hubby Paul and the kids Shelby-Rose and Anakin. I cooked a roast beef in the turbp oven while Paul cooked turkey and vegetables in the barbecue. We had a nice night and were back home and ready for bed before 10pm. It rained overnight and was still raining when I left for work. By the time I arrived ready for work the clouds had parted and the sun shone. Along with the sunshine came strong winds which persisted all day. Today my area was Bakers Creek which I always thought of as “the pits”. I no longer think that. Now I know Bakers Creek IS the PITS. Admittedly 50% of the people I spoke with were genuine types with an interest in their community. The remainder were difficult, negative, abusive types. Added to this the houses are all very old, mostly cheaply built and by appearance have not had maintenance since they were built. Before I left on my collections I spoke with co-worker Gurdeep who had delivered the survey forms to Bakers Creek last weekend. Some of the addresses are difficult to find and one, is on the highway with nowhere to pull off and park. Some hints from him saved a bit of searching and a heads up on where to park to visit the highway property. Today was the final task for the survey so a barbecue was put on by Dheepan the co-ordinator. There was enough food for 40 people although there were only 15 of us. The barbecue was beside the Pioneer River at Bluewater Quays, a reclaimed riverside area turned over to public use. As survey workers we only got to meet each other at the beginning of each day and when we came back at days end to have our results tallied. We really did not have many opportunities to socialise, however some of us were able to establish more than a nodding relationship and it seems these people made up the core of the group. I spent the best part of the evening chatting with Mike and Gurdeep about the work but more interestingly themselves and their background. With the chill strong wind blowing up the river it was a two jacket night. I was home before 8pm. LOTS AND LOTS OF PHOTOS THIS WEEK. The sunset today was impressive in that it looked as though we would get a rogue storm. After giving a spectacular sunset, the storm clouds went away. I watched the sunrise from our dinette table before making breakfast. Donnis had a workday starting in the afternoon. I got a few chores done around WWWGO as today was a fine day – all day – although the temp did not get much above 21°. Eric got on the road about 8.30. He planned to have a swim at Bowen then continue on up the highway to around Rollingstone, 60 klms north of Townsville. Allan and Rae got on the road about 9am with their planned destination being Bowen for a week. Late in the afternoon I took a walk along the beach at low tide to the mouth of Eimeo Creek and to photograph the sunset across the exposed sand flats. This was the beach sunset. Surprisingly there were many people on the beach and more arriving with fishing rods. 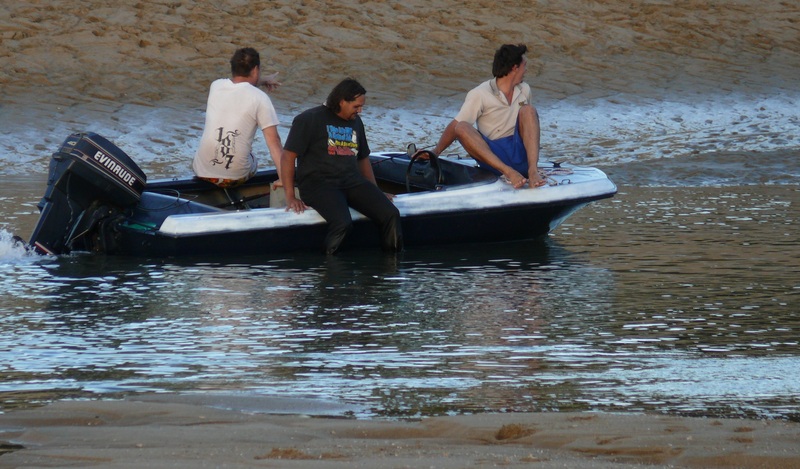 These guys timed their return to the Eimeo Boat Ramp a little late. They ran out of water a few hundred metres from the ramp. The water was so shallow they could not even push the boat to the ramp. 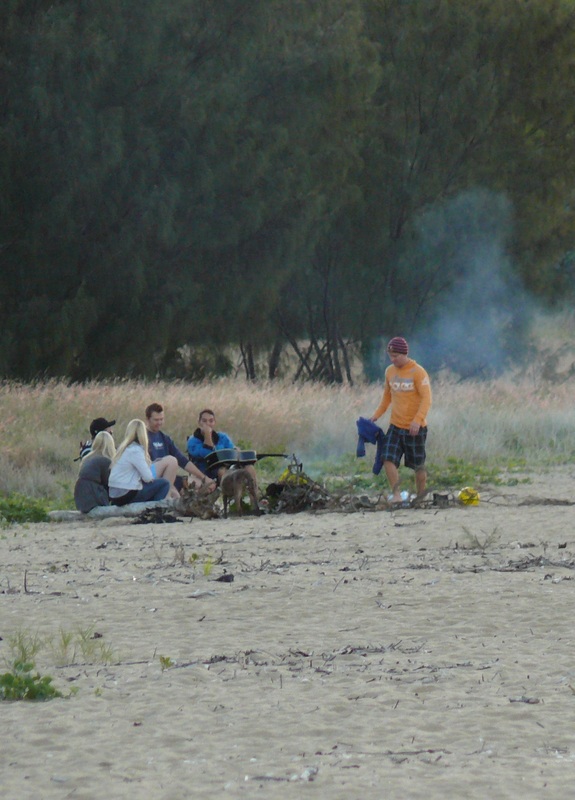 As today was the only fine, sunny and warm day of the Queensland Day Long Weekend, groups of people were still picnicking or walking on the beach and even, gasp, shock, horror, sitting around a fire on the beach. Enjoying a long weekend late afternoon beach fire. A workday for both of us. I started at 9am and on the way home got a haircut. Donnis had a late start. Behind WWWGO is the boat ramp and associated carpark. 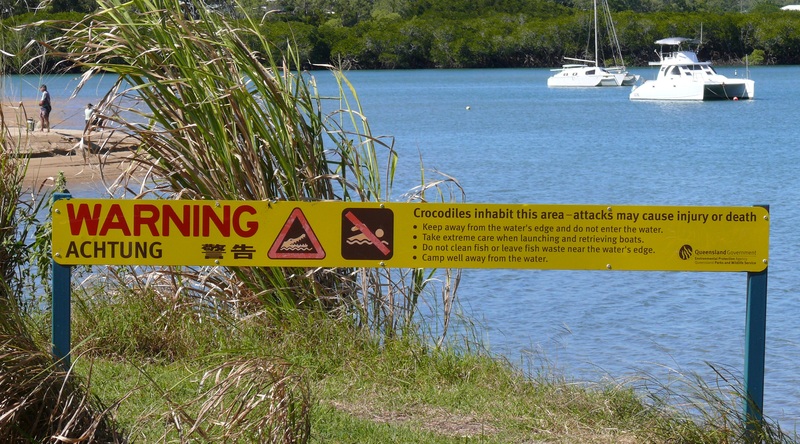 This sign at the top of the boat ramp is a good reminder the creek has these prehistoric survivors living near us. As I was eating dinner, Donnis son Peter called. He wants his ute back. 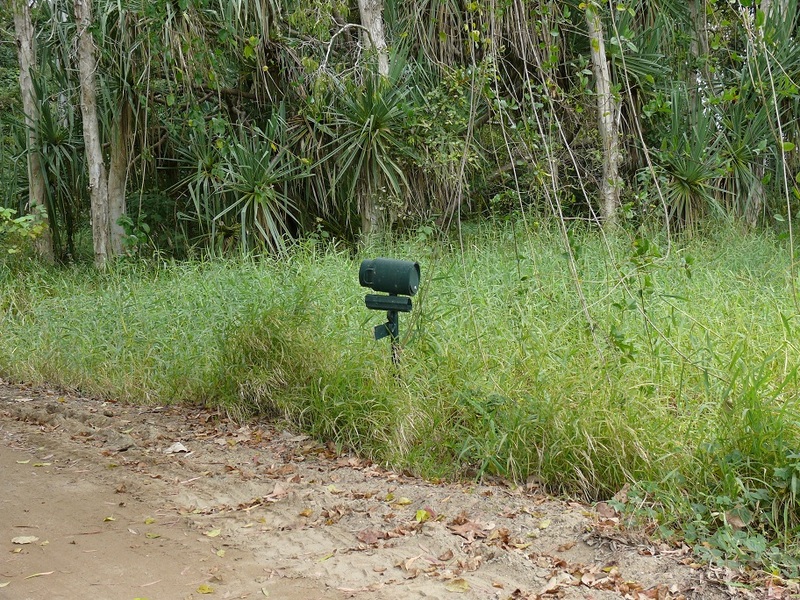 I agreed to drive the ute to Andergrove, pick him up, drive back to Bucasia and he can drive home. As a reward he gave us two live mud crabs he caught that day. 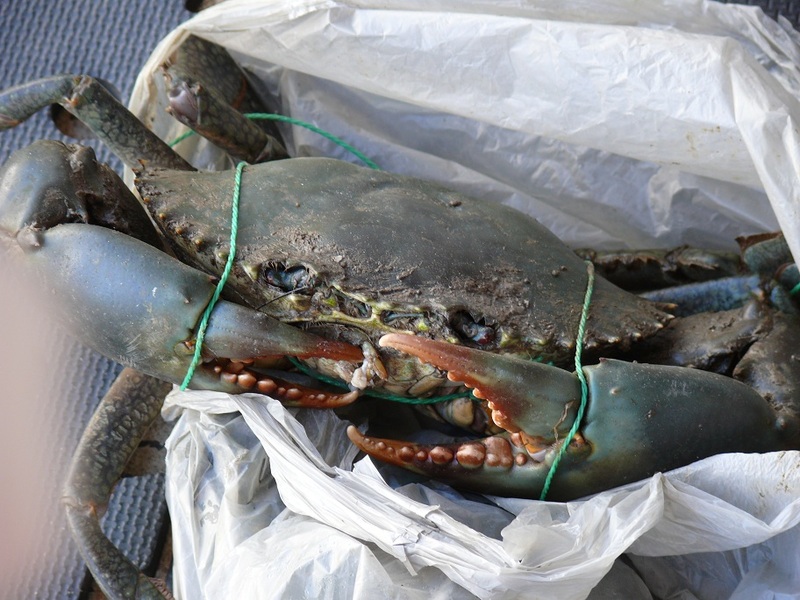 Live Mud Crab as big as the mouth of a bucket. I set some cable tidy clips in place to umm err, tidy the cables. Although we are on 240 volts there will come a day when I have the 300 watt pure sine wave inverter installed. That means when we are reliant on batteries and solar panels, some of our equipment can be run off the inverter. Over many years in discussions with other people in my age group I believed I was a “Baby Boomer”. The other morning a humorous email arrived. It was about traits of various generations. To my surprise, Baby Boomers generation was from 1946 to 1964 followed by the “X” generation from mid sixties to 1981. Ummm. So where do I fit in? The period 1925 to 1945 is known as the “Silent Generation”. Therefore, I am a member of the Silent Generation. A few silent phrases spring to mind. Silence is the source of great strength. After gen X comes gen Y and currently gen Z. Who knows what the next generation after Z will be called! There is also the Lost Generation and the Greatest Generation. It seems only the last century or so has labelled generations. Will the Y or Z generations decide on a new generational name for children born after 2010? It is a day off for both of us. Donnis spent the day studying. I cooked up the two mud crabs for our dinner. Larger of the two mudcrabs. Note thae crab is larger than the dinner plate. I spent the rest of the day reading and gasp, shock, horror…doing NUFFINK! Actually it was not nothing. I did walk along the beach bathed in glorious sunshine and a gentle baby swell was lapping the shore and all the offshore islands were starkly presented as more than dark shadowy smudges on the horizon. I spoke with fishermen on the beach, socialised with new arrivals in the park and generally had a relaxing self- indulgent mentally satisfying day. Oh! Did a couple of loads of washing and brought them in when they were dry. Geez, I musta been busier than I thought. 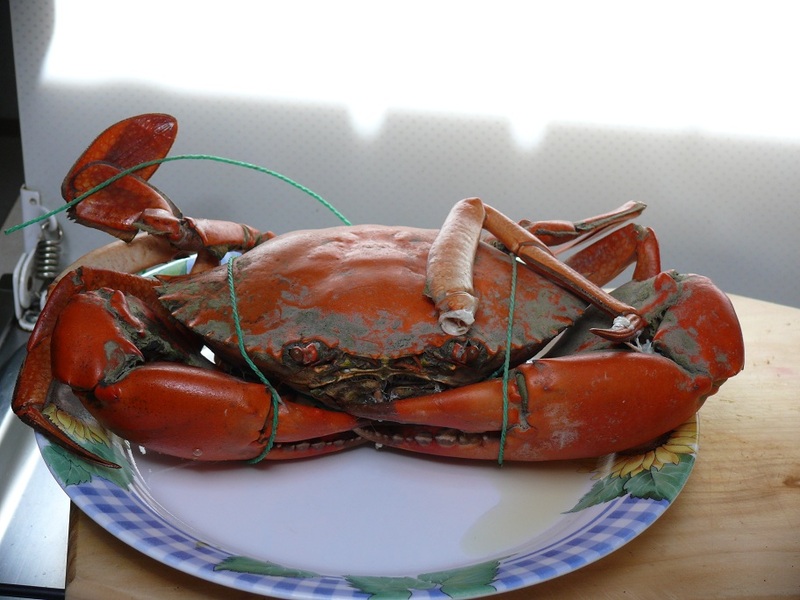 Tonight we dined on mud crab and had cleared up the mess before State of Origin began. Queensland lost. There is still a third game, which is now guaranteed a sell-out crowd to decide the winner for 2011. It is a fitting result for two evenly matched teams. There was an eclipse of the moon this morning. I was awake at 6am but the western skyline is lined with trees so I could not find the moon to obtain a photo. The moon the afternoon before the eclipse. The moon over WWWGO the evening before the eclipse. 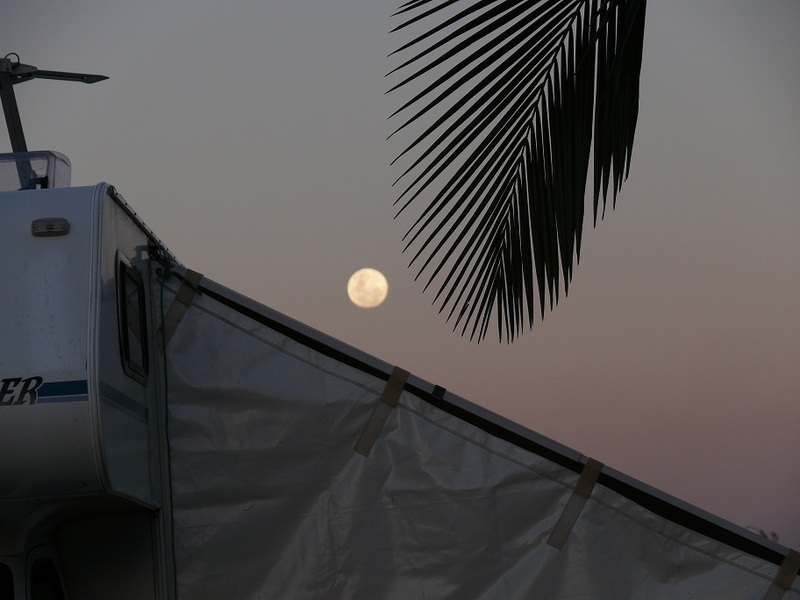 Our neighbour Maria, told me she saw the red moon at 5am through a gap in the trees in front of her caravan. She did not take photos. Interesting rusting and rotting old shed along the Yakapari Seaforth Road. then followed it through to Seaforth and chopped about 30 klms off the trip. Along the road to Seaforth we pass Mt.Jukes. This monolith dwarfs the lonely farmhouse below. The interesting gate to the Mt.Jukes property. Across the road from the Mt.Jukes view is this vista overlooking the coast, Constant Creek, tiny village of Belmunda and Cape Hillsborough. 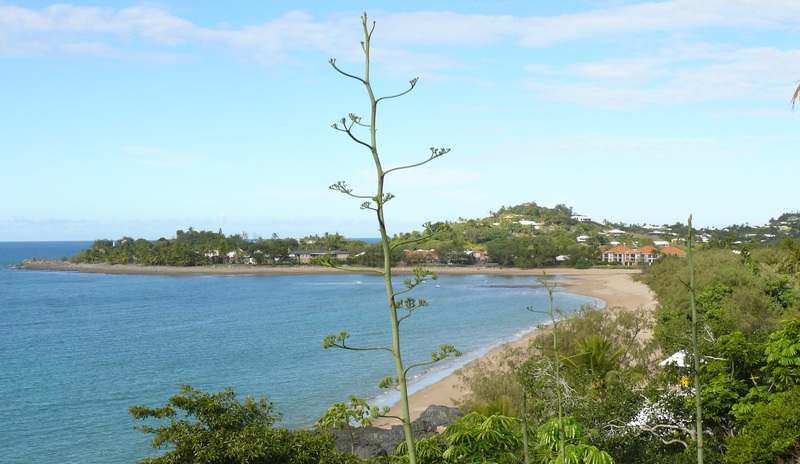 Looking across Seaforth Bay towards, Ball Bay, Halliday Bay and Cape Hillsborough. Joan n George have a very nice house at the beach which they renovated themselves, George is 74 and Joan in her mid 60’s but they claim their renovating days are over. After a delicious lunch of home-made pumpkin soup by George we went for a walk to the point overlooking Rabbit, Newry and Outer Newry Islands. Then a walk to some closer islands connected to the shore by a causeway. Redcliffe Island, one of several small islands, connected by a natural causeway, at the northern end of Seaforth Beach. It was decided to stay for dinner, courtesy of George. Before dinner we tried some home-made Cumquat Licquer made by George. After a dinner of Ox Cheeks and a few glasses of wine we stayed the night in their guest room in the downstairs section of the house. 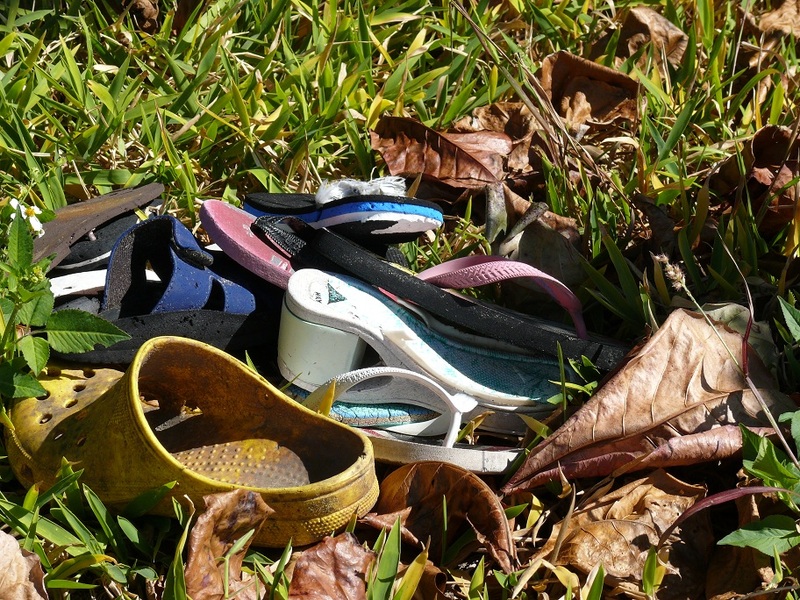 …and a collection of flotsam shoes. and a drink before we headed home at midday and called in on another friend, Syd B, who also lives at Seaforth. For dinner I used the left over crab to make a Crab and Sweet Corn Soup. This morning, after driving Donnis to work, eating breakfast and before washing up and getting dressed for work, I enjoyed a cup of tea. At the time it was cool, about 17°, and a steaming cup of tea was welcome. I drifted into a reflective state of mind, which at times like this, when it is peaceful, it is easy to drift into reflectology. I thought about our travels to date, our last two days of visiting and seeing more of Oz as well as our ability to be able to do these things without planning. At least most of the time. Planning is needed to achieve a no planning state. Our life at present is quite enjoyable and I am pleased we can do these things…because we can. I am a planner by nature but yearn to experience without planning and let things happen and not worry about a load of washing which needs to be done or clothes brought in off the line or whatever we thought had to be done at a certain time. And so it came to pass that as I finished pondering the imponderable it was time to go work. While walking I found a Cumquat Tree loaded with healthy ripe fruit. I asked the owner if I could have some. He grabbed a pair of secateurs and helped me to a bountiful harvest. I have all next week without work so perhaps I can make some Cumquat liquor or Cumquat marmalade. A cold morning when we woke at 5.30. It was a workday for both of us. Nuthin’ else to report for today. Today was mostly overcast. 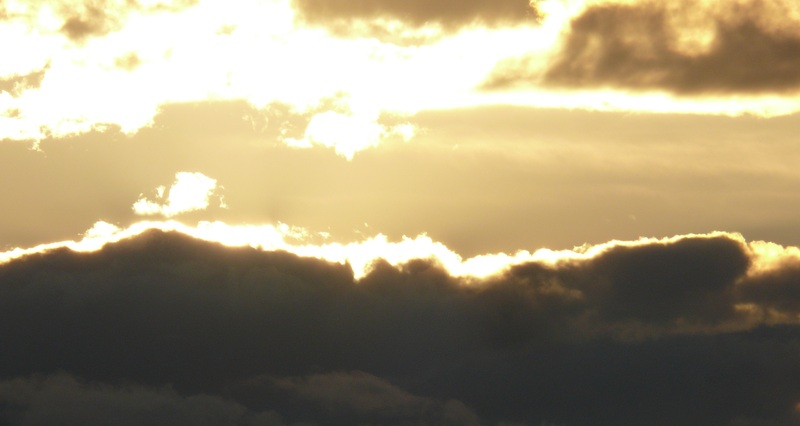 The sun peeked through the clouds a few times but mostly it was a shadowy type of day. Today was Shoal Point Day. That is, I rode on Virago to Shoal Point, walked around and took photos. 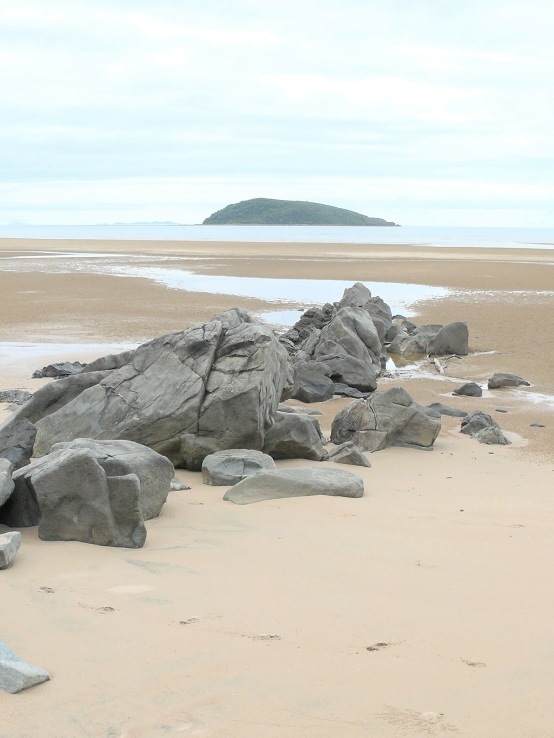 At low tide you can walk from the Shoal Point mainland to Little Green island. to Reliance Creek which had good fishing and I believe still does. We could also drive our 4WD either from SP itself or further around the beach at a place we knew as Hodges. Hodges letterbox. On the side of a sandy track but in a Melaluca Swamp and about three hundred metres from the homestead. We could drive along the beach to the mouth of Reliance Creek and fish from the sandbanks or simply picnic. These days access to Reliance by 4WD is prohibited by Council By-Laws and fences. Cars can still access the beach at SP to launch and retrieve tinnies but can drive no further. Time, tide, storms and cyclones have changed the face of the beach. Dead Melaluca standing where once the land once was. I rode to Hodges and found the barricade fence but it is no longer needed. The sand has been washed away, exposing a huge spit of boulders which 4WD cannot get past anyway. This area was once all sand. Much of the embankment has been washed away and the few lone dead Paperbark trees standing on the beach are testimony to where the bank and tree line once was. 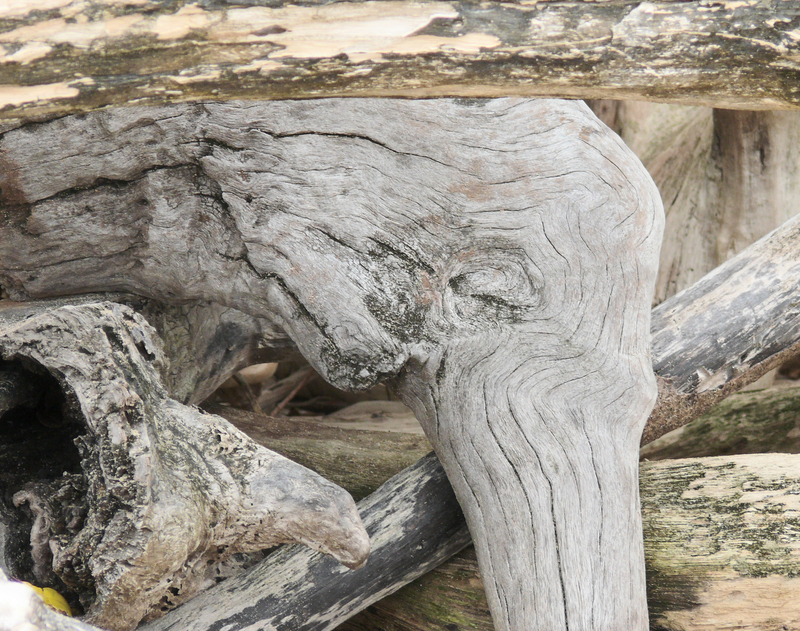 The fallen Melaluca and Mangrove Trees provided some more driftwood art. This one should not need a name but to be certain we are both on the same page and see the same thing I have simply called it, Snake. 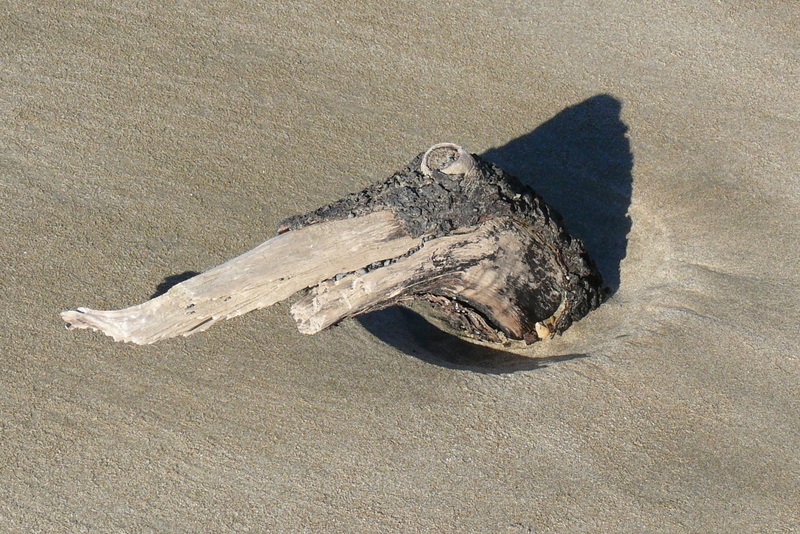 More driftwood art. I call this one Elephant and I am sure we see the same thing. This one is not so obvious. To me it looks like a Sea Lion. The long spit of shoals running off Little Green Island towards Reliance Creek is still there and if anything, much larger, higher, taller and longer than it once was. Once upon a time as the bottom of the tide was running out, we could walk to LGI and spend half an hour exploring before heading back to SP to avoid being caught by the 5 or 6 metre tides rushing back in across the shoals. Fishing off LGI was good and a family friend, Geoff S, now deceased, had a net fishing license. 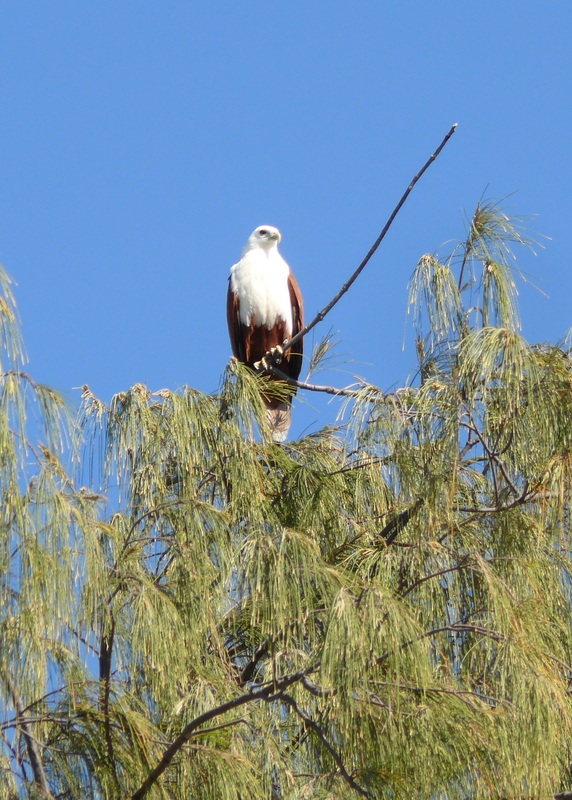 He mainly caught Queenfish but always had stories about the huge bad tempered Hammerhead Sharks which plagued his fishing when he would have to fight the sharks to keep his catch but often ending with half a fish. Geoff would never swim in the local waters. OK. The news on the closed Keeley’s Road Slade Point. It seems four men in their twentie’s found a UTube site on how to make a bomb. These budding Einsteins built the bomb and were taking it somewhere to harmlessly set it off “just to see what would happen”. Instead of packing it in the back of the ute, these high IQ lads kept it in the passenger compartment, along with themselves. For reasons not yet known, this volatile chemical bomb detonated. The force was enough to bend the ute out of shape, blow out all windows and bring the ute to a halt. All four escaped with their lives. Two were flown to Brisbane and one was in a critical but stable condition. It should be noted that all four somehow got out of the ute (or were helped by people from nearby houses) before a second blast which it seems would have killed them had they still been inside. Today, although a workday for Donnis was an Eimeo day for Frankieg. Eimeo is just across Eimeo Creek and can be seen from WWWGO where we are camped at Bucasia. Eimeo was once a sleepy little village but has grown up in recent years although some parts of it still retain the rustic, um err charm? Perhaps charm is not the correct word. Maybe it should read “rustic unkempt, unrepaired cottages surrounded by multi-million dollar abodes”. A bit of history can be found here http://eimeohotel.com.au/history.ph. 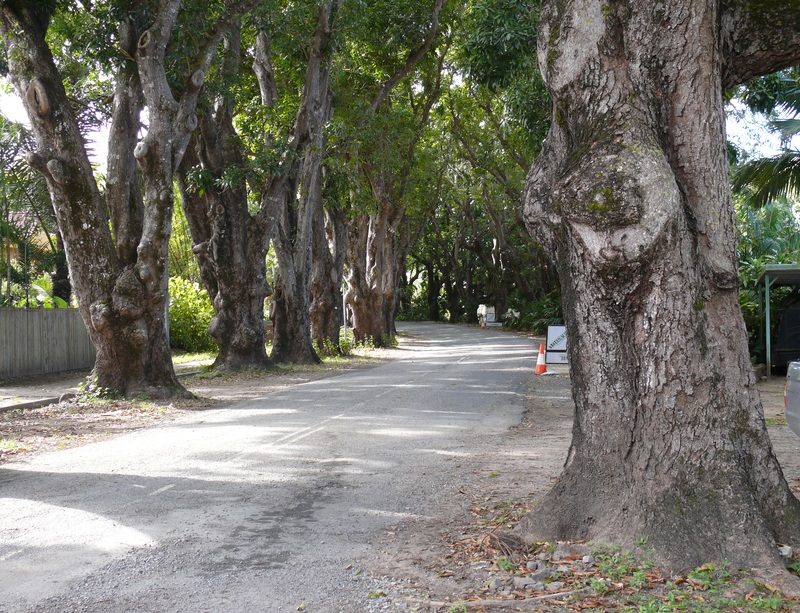 It is interesting to note the mango trees, planted by Jeremiah Armitage in 1870 are still here today and are on the Heritage List and line each side of, appropriately named, Mango Avenue. Mango Avenue, Eimeo. Try to imagine the fruit from thirty something trees dropping their entire crop of mango's on the roadside. The locals will not collect or eat them so they sit on the road and rot during summer. It should be noted these mango trees are known as commons. That is, they are the original mango’s and not the hybrids we enjoy today. Commons tend to be a more stringy texture and are probably best suited to making juice, chutney and jams. These trees drop their abundant fruit during the summer months and the fruit piles up on the roadway and rots. It also gets squashed under countless tyres of cars on their way to Eimeo Hotel or the beach. The smell at the height of summer is a bit strong. At the end of Eimeo Road, at the top of the hill, is the South Pacific Hotel. 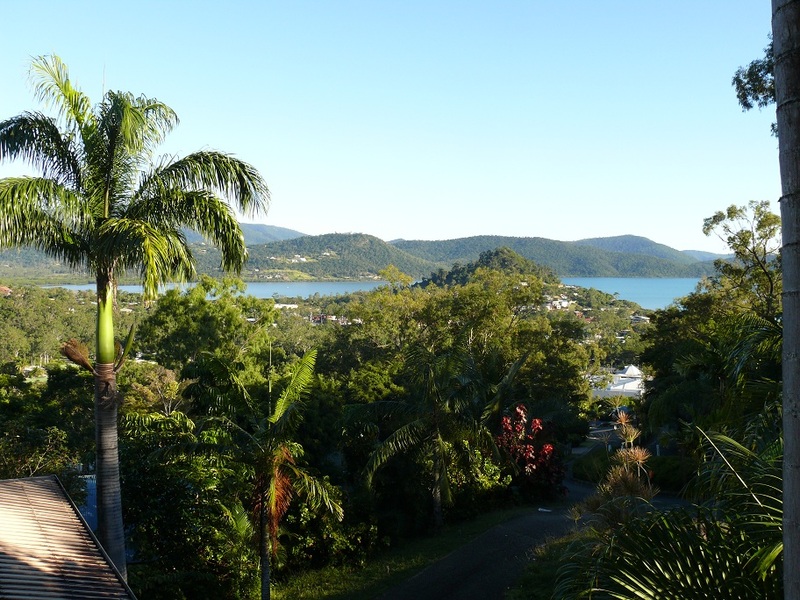 The view across the ocean to Brampton and Carlisle Islands, St,Bees and Keswick Islands and the beginning of the chain of Whitsunday Islands is spectacular. Closer is the view over Eimeo Beach towards Dolphin Heads. A boat owner working on his boat, which has seen better days, has run a power lead from his house in Sunset Boulevard, across the street to his boat pulled up into the mangroves and tied to a coconut palm. 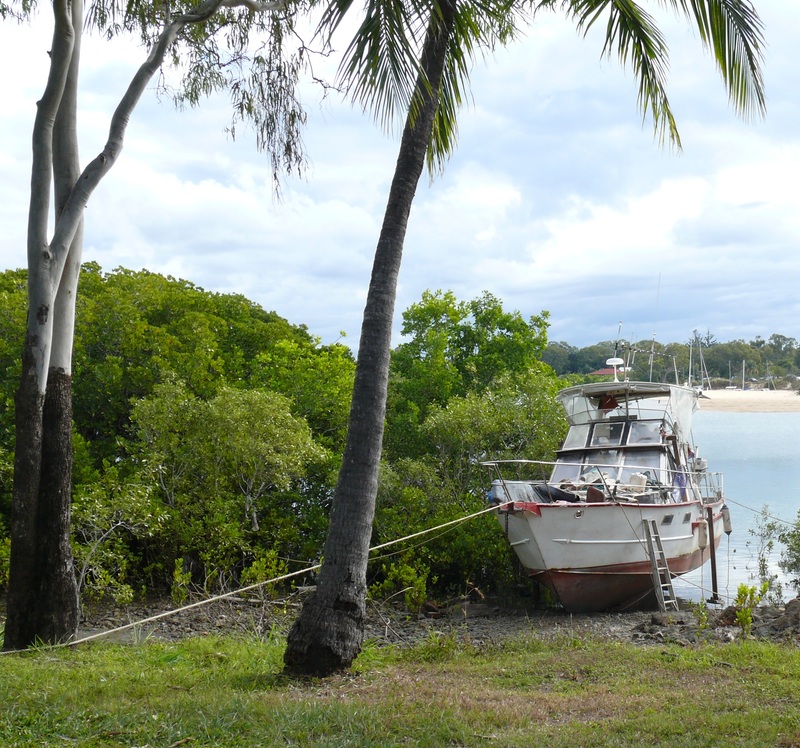 Tucked into the mangroves beside Eimeo Creek and tied to a palm tree. The views from the Eimeo Pacific Hotel are just spectacular. This is a place worthy of a cold beer, a café latte and cake or a full meal on a warm summer afternoon. Or anytime for that matter. Blacks Reef Rocks. 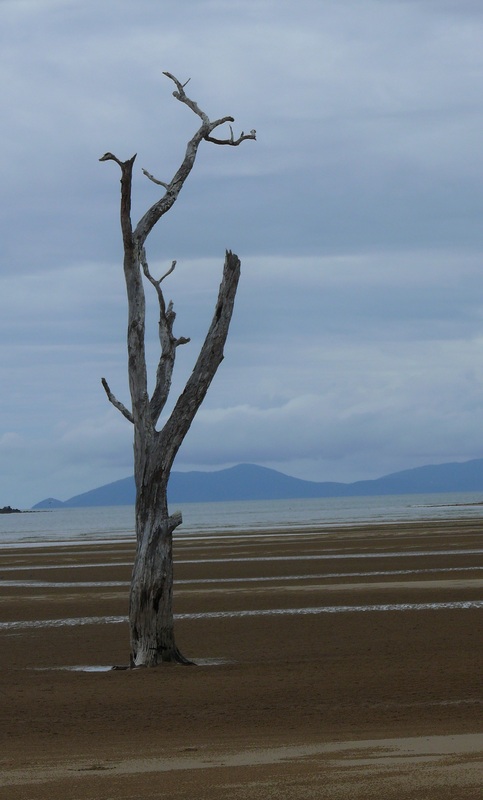 If you enlarge the photo, the Whitsunday Islands appear as darker smudges in the background. Today was a day off for both of us. I spent the morning taking down the tarpaulin, annexe ends and all the other bits n pieces we have set up outside over the past few weeks. Tomorrow we take WWWGO to Mackay to have the 240volt section of the refrigerator repaired. It still rankles that I have to do that whereas a typical home owner can call a refrigeration guy and he makes house calls. Donnis received a phone call from the nursing home at Mirani. It seems a job may be available in two weeks. We drove out to Mirani for an interview and I did a recce of the town. There was once a very good bakery and coffee shop. It has gone and in its place is a pharmacy. I drove out of town and down a 4WD track under the bridge to see the Pioneer River. Beside the road bridge is a much higher, elevated rail bridge. From ground level I looked 30 metres above me as a cane train rattled by, clackety clack, with over 100 carriages filled with harvested sugar cane on its way to Marian Mill. Let me tell you it is a little unnerving to have a train on a bridge 30 metres above you take 10 minutes to pass overhead. We will know about the job in the next few days. On the way home I decided to turn off the highway at a place called Farleigh and take the back roads through a number of valley’s to Habana, Nindaloo and back to Bucasia. Today we battled peak hour traffic to arrive at the refrigerator repair place close to 8.30am. We left him to the work while we went for coffee with my sister Sandra, also known as Shan and more often these days, Sans. We also got to catch up, for a few minutes, with her daughter, Jo-Elle. In the early afternoon the refrigerator was repaired. The repairer cannot be sure but believes there was a loose 240 volt connection to the heating element. One spade connection was loose and blackened and has probably been just barely connected for some time. The element has been replaced and the connection tightened. One good piece of news was that our refrigerator venting is via a roof mounted heat dispersing cowl. It is a very efficient method for these types of refrigerators. Cold from the southern states invaded us today along with a miserable drizzling rain. Our world has shrunk. When confined inside the warmth of WWWGO there is not much space. While Donnis sits at the dinette table and studies. I sit at the head of the bed, a distance of less than three metres and read. It is cosy but highlights just how small our world has become. In the warmer weather we would both probably sit outside under the awning, even if it was raining but the icy breeze from down south is something we are not used to. This evening just before dinner, the power to the whole camp went out. I suppose when everybody arrives home from work and all the new arrivals all turn on their air con or heaters and stoves and TV etc, there has to be an instant power drain. A minute or two and it was fixed. A work day for both of us. It was cold, wet and miserable. During my morning survey pack delivery it rained, driven by cold gusty winds. I had been given a plastic, one size fits all, poncho. That lasted about 10 minutes before I took it off and donned my own heavy duty, Drizabone inspired raincoat. (http://www.drizabone.com.au/ mine is a Rainbird http://www.gondwanaoutdoor.com.au/gondwana-rainbird-clothing.html ) It was much better at keeping me warm and dry. The cold rain continued for most of the day. Then it was just overcast and cold. Brother Allan and his wife Rae arrived and pointed out how cold it is here in the tropics. They are set up about 50 metres from us. Friend Eric arrived late in the afternoon and he set up at the end of the caravan park. We all went to dinner at the Northern Beaches Bowling Club along with my daughter Averyl and children Shelby-Rose and Anakin. Sister Sans and husband John, niece Kelly and her fiancé Jason were also there. It was a pleasant family night together. Another workday for Donnis and myself. Thank goodness it did not rain. This evening we had a barbecue dinner with Allan & Rae as they will be driving to Bowen tomorrow for a week before heading further north to Cairns. I received a call asking if I would agree to a change of shift to Tuesday and Saturday, Sunday this week. It is OK with me as this is the final week for delivery of letters and survey packs. 194. Sunday 5th June 2011. Another week in Bucasia and we end with…a bomb??? Today was another of those perfect tropical days. Brilliant sunshine, no clouds, a light breeze, a little cool in the shade. View across the creek to Eimeo Point and St.Bees Island in the distance. If it was not for the water it would look like a scene from Afghanistan. The local dog catcher called into the park at midday. Just out of my line of vision (I was too polite to get up and go over and watch) a group of local campers and the park manager all seemed to be offering help. At least there were no raised voices or loud barking or shouting. Shortly, the catcher emerged with a dog on a lead. Then without any fuss the catcher lowered a cage at the back of the ute, the dog was led in, the cage raised and slid into position and the hydraulic back section was folded up into place and within moments was gone. The ladies waved goodbye to the catcher. Hmmm! Or were they waving goodbye to the dog? Of course I was sitting in the sun in my lounger while all this was going on. In the afternoon I went for a walk across the exposed sand to Eimeo Creek at the bottom of the tide. When I first lived at Bucasia twenty years ago there was a sand spit on the edge of Eimeo Creek. 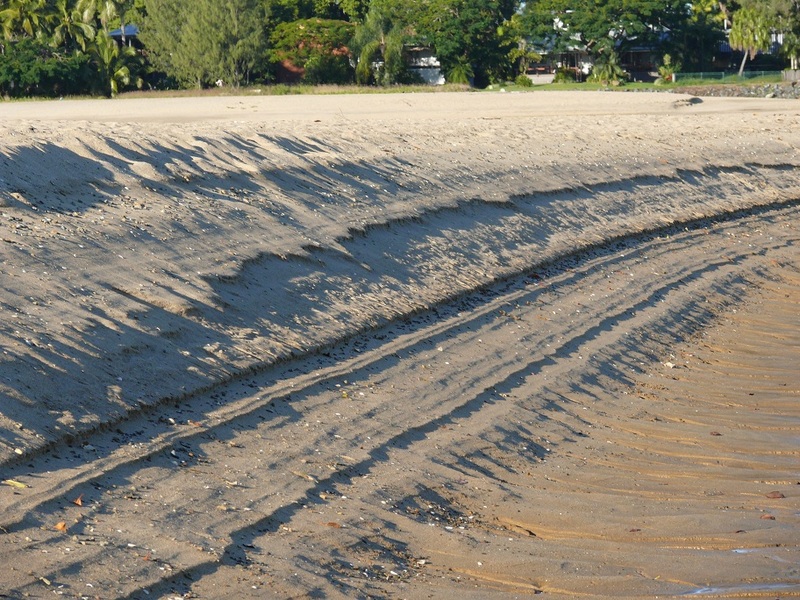 Over the years the sand spit has gradually washed away. In its place, a new sand spit is growing and creating a sort of harbour between the two spits. I watched as a spotted terrier dog, leapt into the swiftly flowing creek and swam (um err I suppose it was more of a dog paddle really) across to the other side. Here is the little spotted terrier swimming the deep and swiftly flowing creek. There was nobody on the other side calling to the dog, just another dog. Bye and bye they caught up with each other and ran around like a couple of idiots playing in the sand. 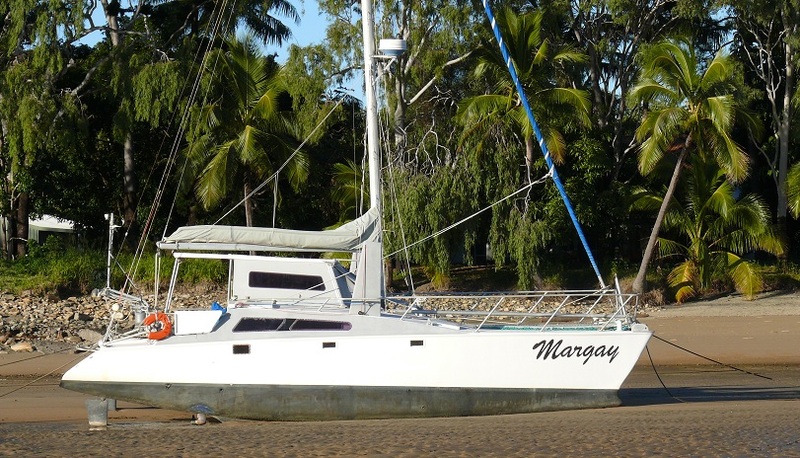 Close to twenty years ago I joined the Mackay Sailing Club with a view to being involved in the sail racing scene. My very first race was on MARGAY. Race is a bit of a misnomer as we were the last across the line exiting the old harbour and last to arrive back late in the evening. I was bored as once the sails were up there was nothing else to do. Even raising the sails was an automatic event, handled by the skipper in the cockpit. I felt like I was only there as ballast. 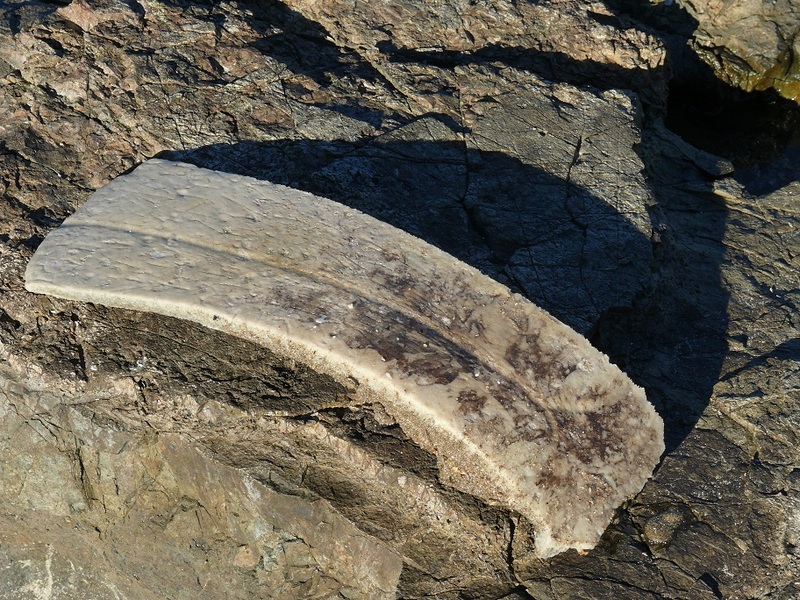 Beachcombing at low tide reveals the remains of...something. Unsure what it is. Normally this is a work day for me. Because Donnis has a new roster and now has an afternoon shift, I arranged for the day off. In the morning we drove to Andergrove and collected her son Peter’s ute. Peter is working in the wilds of Western Australia for two weeks and has no need of the car until he returns. 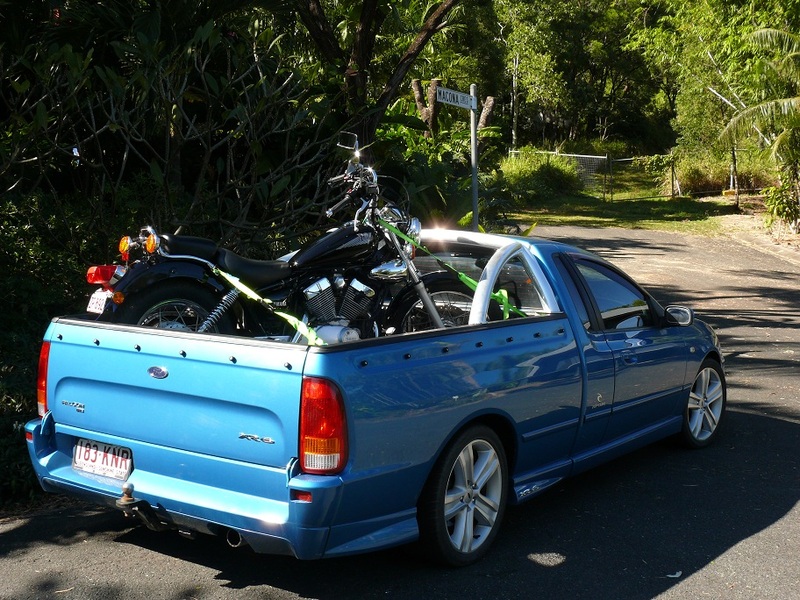 Wednesday we both have off so will drive to Airlie Beach and collect the motorcycle. Pity we did not plan to do this Monday morning or even over the weekend. That would have given us two cars and I could have gone to work today. A day’s work is worth around $200 so that would come in handy for our build-up of funds. The 9kg gas cylinder became empty on Sunday while Donnis was cooking dinner. I had it filled at the park office this morning. Hmmm! That has given us around 6 weeks of usage of cooking meals. It has not been used for heating water for showers and not used for boiling a kettle for cups of tea or washing up. We are connected to 240 volts and use the electric kettle and toaster. When used for heating water we achieved 18 days usage last October. Wednesday 1st June – Winter has officially arrived. I am sure glad we are wintering in the tropics and not down south somewhere. We drove to Airlie Beach and visited our house and collected some stuff from the shed and dropped some stuff off. It seems my Ratsak packs I left last September are now all empty and there appeared to be a rats nest built on the old recliner. We pulled the recliner out of the shed and offered it to our renter, Zac. He accepted. Donnis grabbed here massage table and has promised me regular massages. In exchange I agreed to leave my delightful closed cell foam rubber lounger in the shed. She also agreed to leave her juicer which has never been used. So… we get rid of some stuff out of WWWGO and make up for that loss by bringing some stuff back. Overall we are probably carrying less weight in WWWGO as a result. We also found my motorcycle helmet and gloves. Friend Karen G lives at the top of Island Drive in Cannonvale and asked us to stay the night and of course to have dinner. This is the view from Karen G house at the top of Island Drive Cannonvale. Donnis and I had our wedding "reception" here two years ago. Last post I mentioned walking up the purported steepest street in Mackay, if not Australia. Mind you, that information came from the locals. I am here to say Island Drive, in my opinion would probably be much steeper, way longer and with doglegs. We had a delightful evening catching up with Karen, eating a prawn cocktail as an entre̒ and followed up with Pacific Salmon in savoury cornflour and lightly shallow fried. Mango cheesecake with a cup tea for dessert rounded off the meal. Thanks Karen for dinner and the comfy bed. Karen gave us a lavish breakfast of bacon n eggs with tomato on toast. By the time breakfast was over I was ready to go and collect the Virago. 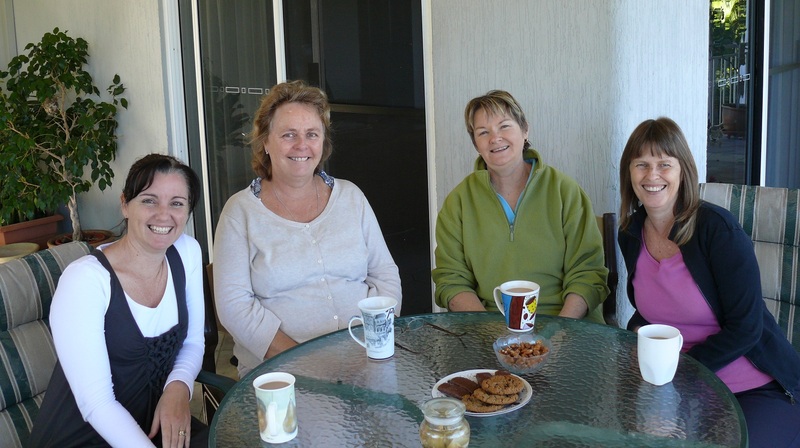 A couple of friends of Donnis n Karen arrived at the same time I was leaving so Donnis had a long morning tea catching up with Karen A and Ros M.
Virago on the Ford ute ready to be taken back to Bucasia. I dropped in to the office to see my ex work buddies. Good to see that apart from Maria and Keith the directors, Joey, Darren, Ian, Sim, Syna and Brian are still there along with a couple of new recruits. Coincidentally another workmate, Sally called in on her way home from a month on the Gold Coast with her new baby. After a round of coffee, cake and question time I was on my way to collect Donnis and head home. But first…Karen had a few computer issues. I was able to re-install her printer, load Skype, re-establish her Firefox and Google and set up a new internet home page. I could not resolve the wireless issue but as she can connect by LAN is not without internet. Her local computer guru may be able to help as I believe it needs a password to re-connect and she cannot find or recall the password. We drove back to Bucasia and unloaded the Virago and surprise, surprise it started first time. I took it for a ride up the road to blow a few cobwebs out of the system as it was running a bit ragged. I will spend a bit more time sorting it out next week. Arrived home to a partially defrosted refrigerator! I switched to gas, mumble grumble, groan, spit, cuss, complain and despite trying all the bits I know (both of them) I failed to get the fridge to live on 240 volts. What I failed to mention yesterday, because we were still cogitating, (do you like that word?) over a few phone calls we received. One was for a job which I had applied for two weeks ago and they wanted to set up an interview on Monday. It was a coal sampling job, 5 days a week and driving to various mine-sites and collecting samples. Initially I thought it may be a two or three day a week casual position because it was advertised as casual. Not so, it seems. They want a five day a week position. We never discussed pay or conditions as it already fell into a “I cannot commit to 12 months or a fixed five day a week job”. After all, we want to be on the road in a few months. We discussed pro and cons such as lots of money against we would need another car. Good long term job as against dirty, noisy and lots of coal dust in the lungs. If we stayed and took on a 12 month contract and buy a new car, what do we do with it in 12 months when the market for used cars and motorcycles is already overcrowded and new cars selling for around $15,000. I had a couple of calls from the employer but had to decline. Donnis received a call from the Nursing Home near Finch Hatton. That was the job we wanted when we first arrived and that one is on the backburner for a few weeks. 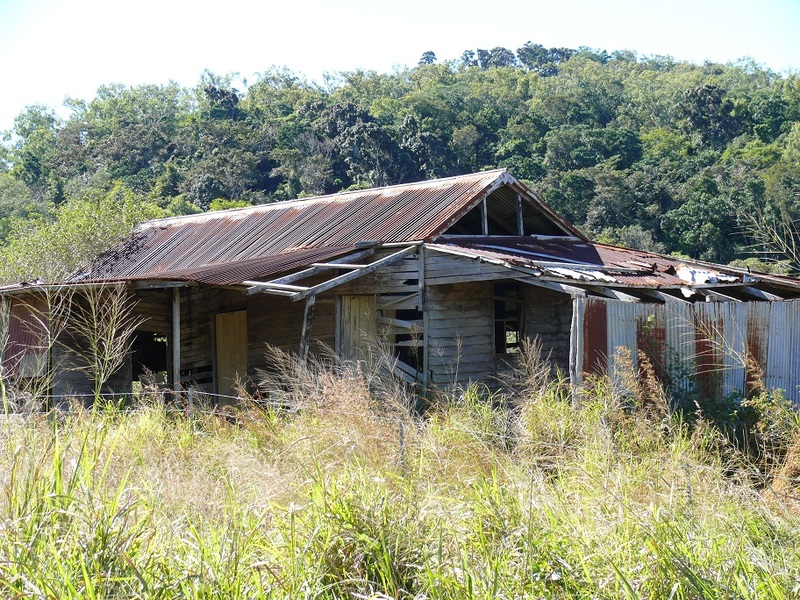 If the Census job does not happen we can still move back to Finch Hatton. I do not believe we would achieve anything by doing so. I called the Census office in Mackay and it seems they are waaaay behind in their recruitment program and staff have not been interviewed or appointed and some area managers have quit before they got started. I got the impression help is being sent to sort out the local Census. It could be another couple of weeks before I hear anything more but I know there is 8 days training commencing around 8th July in Brisbane so they need to get a wriggle on. Today I went to Andergrove to collect the spare wheel for Peter’s car. It seems the car is lowered and the spare will no longer fit underneath where it orta be. He keeps it in the spare room where he lives. Thankfully it was left in the carport as promised. Next I went to Mackay to sort out the fridge issue. It seems the only people qualified and approved to do the job are in Mackay and will not or cannot do house calls. I have an appointment to take WWWGO to them next Thursday. YES. That is correct. I have to take down all the stuff I put up outside, awning, awning ends, shade cloth, tables, chairs, ladder, bicycle, laundry room and whatever else and pack them all up on the concrete outside and drive WWWGO into Mackay by 8.15 so we can be first job of the day. This is “F*****G” frustrating and tedious. After all, this is our home, it is not so easy to pack everything up to move it to Mackay for a few hours and bring it back again. Thems the rules old boy. Want it fixed? Bring it in on Thursday. That was basically the attitude of the repairer. Sort of take it or leave it. Oh well. These things are sent to try us. Next job on the list is extension valves for the rear outer wheels on WWWGO and a set of chrome dress rims. Just my luck. The spare parts man is out. (he was out when I called him a month ago and he promised to email me a catalogue) the lady called him and he pointed her to the extension valves, none of which are the 180° curved version I need. They also need to see our wheels to determine what rims will fit. I need to see the product and a price list before I commit. I could wait for the spare parts man to come back but no time was given for his return. I Can’t Get No, SATISFACTION” (thanks Mick Jagger). Next I went to one of those cheap warehouse style places that sell OKKY straps by the truckload. Umm. “Waddaya mean you have’nt got any? You always have a whole wall of em” Sold out! Off to Bunnings. They always have OKKY straps in all shapes sizes, prices and bulk packs. My shopping day ended there. It was a generous size pizza, enough to satisfy my lunchtime craving and enough to mess up my low carb diet and enough to get the bad taste of the mornings non shopping event on the other side of the town, out of my mouth. Today was a workday for Donnis and myself. I walked 13 klms today. As luck would have it, my district today was Slade Point. I got to see all the beachside area in all its beautiful sunny and mild winter best. Sorry, I do not carry a camera when I am working. On my way home from Slade Point to Bucasia there was a roadblock with Police having closed off traffic in both directions. In fact the usual rubber neckers were also held back from the barricade, about 200 metres in both directions. Hmmm! I could not see any accident but could see an ambulance. Perhaps there was a house fire? Perhaps a hostage situation? Perhaps a shooting? Of course there was nothing on the national news and the next local TV news will not be until Monday night. It rained today and this evening. Only a short work day and a short walk day. I walked 5klms although it all helps with the exercise regime. Last week I placed an advertisement in the Mackay Pocket Trader for an annexe for a caravan. I received a response from a guy living on a property outside Sarina about 50 klms from Bucasia. After work I drove to the property and had a look at the annexe. It is an Aussie Traveller and although he has never used it, the previous owner obviously has. After looking at the annexe walls and extra bits n pieces I became quietly confident this was what I was looking for. It was in good condition and he hinted at a price which I found acceptable. That is, until I ran a tape measure over it. The length was fine but the width of awning was a maximum of 2.4m whereas ours is 2.8m. Although the rafters are the extendable type, they only extend to 2.4m. Oh, well, will have to keep looking. Maybe if the planets align with Mars we could afford to get a quote on a new Aussie Traveller. Oh! Pooh! The planets were aligned a couple of weeks ago and Mars was in the alignment. Maybe I started my search too late! According to a brief report in the national news, a home-made bomb exploded whilst being carried in a ute being driven at Mackay. The three men in their twenties who were in the ute were all taken to hospital. More information will come to hand in the next 24 hours. Looking at the brief video footage I recognised the street where the ute exploded and was cordoned off last evening.